Beleza tranquila abunda com vista para o lago, montanha e prados. Localizado em Lake Elmore, Vermont, este belo apartamento recém-construído oferece vistas deslumbrantes em cada temporada. Nosso apartamento possui uma cozinha completa, com capacidade para 6, todos os novos aparelhos de aço inox e bancadas de granito. Há uma casa de banho completa e lavadora e secadora. Um quarto tem uma cama queen-size, enquanto o segundo quarto tem uma cama de casal e uma de solteiro. Arranjos de dormir acomodar até 5 pessoas. Todos os colchões são novos, e ambos os quartos têm armários amplos e áreas de armazenamento. A sala de estar / sala grande, com seu teto de catedral, é muito bem decorados, com várias mesas artesanais personalizados. Um deck privado oferece linda montanha, lago e vistas de terras agrícolas abertas. Muitas janelas do apartamento criar uma luz, sensação arejada. WIFI, HDTV / Satélite / DVD / jogos, fazer essa escapadela de férias completa. Nosso apartamento no andar de cima tem uma entrada privada e está localizado em uma estrada da cidade beco sem saída no meio de uma fazenda de 35 acres. Elmore é de 20 minutos de Stowe, a 30 minutos de Montpelier e uma hora de Burlington. Com o seu lago, parque estadual, praia pública, passeios de barco e acesso à pesca, Elmore tem muito a oferecer aos visitantes. Canoas, caiaques e pedalinhos podem ser alugados na praia de estado, uma caminhada fácil da nossa propriedade. Trilhas para caminhadas até o topo do Mount Elmore levar a uma torre de observação com vista panorâmica. A área oferece numerosos durante todo o ano atividades recreativas e turísticas, incluindo downhill e esqui cross country, surfista (a trilha VAST estado cruza nossa propriedade), e uma variedade de eventos culturais e artísticos nas proximidades. Passe as férias apreciando a beleza de Vermont nesta tranquila lindo fuga,, convenientemente localizado! Desfrute do nosso costume construído casa de banho com piso radiante. Three old friends had a great weekend at Sharon and Brent's catching up and relaxing. In between x-country ski days at Craftsbury and Trapp's, we relaxed with a lovely snowy view of Elmore Mtn and the lake. For three people, the apartment was perfect. A well appointed kitchen with everything you need, three comfortable beds, and a great living room to enjoy the view and chat about past days. We loved it and will definitely plan to stay again when the next opportunity arises. Thank you! We are so glad that our apartment provided a good space for your friend's reunion. Take care and enjoy the rest of this snowy winter, which seems virtually endless! The apartment is beautiful and very well done/decorated. This was our first time staying somewhere with the owners on site. You have a separate entrance and it’s very private. Sharon and Brent are welcoming hosts, and their property is gorgeous. They make their own maple syrup, and it’s so yummy! We were there during a big snowstorm, and Brent was so kind to help as our car got stuck. We were there to ski at Stowe, and it’s about a 40 minute drive. We will be back for skiing and to explore the area during the warmer months. Highly recommend this property! Yes, you folks had quite an adventure here during the huge snowstorm/blizzard! We are glad that you were so flexible and that your family had a good weekend in spite of the incredible amount of snow we received and the cold temperatures here. Take care and enjoy the rest of the winter. Spacious with high quality bedding and kitchen. The views are amazing. Owners are very welcoming. Hello, We are so glad you enjoyed your stay with us. Take care and have a good winter! We were in the area for hiking in the fall foliage and checking out the breweries, but wanted to stay somewhere out of the way. The apartment was a perfectly charming, quiet place to come back to after long days out and about around the area. We are glad you enjoyed your Vermont stay in our apartment. Have a great fall and upcoming winter! My wife, daughter and myself really enjoyed our stay with Sharon and Brent. They have a gorgeous property and the view of the mountain from the deck is beautiful. The location was perfect for all the things we wanted to do and they offered helpful suggestions for places in the area to visit. The place was so clean and perfect size for the 3 of us. The backyard is spacious and my daughter loved the swing on the tree! They offered us some of their jam and syrup which we can't wait to try! Hopefully we can return here again. We are so glad you enjoyed your Vermont visit to our property. Happy fall! We had a relaxing stay in this apartment while visiting this area of Vermont. The apartment is very clean, the kitchen has plenty of pots, pans plates, etc if you want to cook, the bed was comfortable, and the view is beautiful from the small balcony off the living room. We enjoyed going to Lost Nation Brewery, and The Alchemist Brewery nearby. It's a nice walk to Lake Elmore and the Country Store, and there is hiking at the state park nearby. Sharon and Brent were great hosts and were able to provide helpful information about the area. Their welcoming gifts of maple syrup, and two kinds of homemade jam were greatly appreciated. 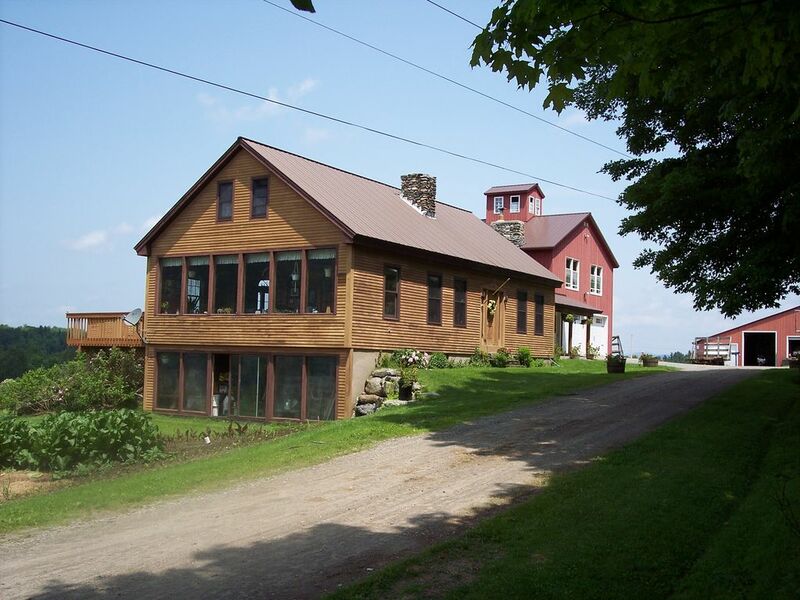 We enjoyed our stay and would definitely recommend this property to others interested in the Stowe area. We are glad you enjoyed your stay with us in Elmore. Estamos a 20 minutos de Stowe e tem um lago e parque estadual a uma curta distância da nossa unidade de locação. Alpino, esqui cross country e surfista são atividades grandes de inverno. O lago fornece muita diversão de verão, incluindo natação, uso de canoas, caiaques e pedalinhos. Trilhas para caminhadas e trilhas para caminhada abundam. Muitos eventos culturais e artísticos estão dentro de uma unidade fácil.